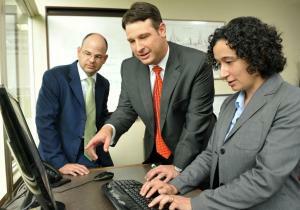 We built our firm to integrate both information technology and management consulting. We have always recognized that information technology is a continual source of powerful new tools. But in order to apply these tools to complex organizations, one must understand the "people" side of business—management consulting. We approach this mission in a way that sets us apart in the marketplace and has enabled us to build a track record of more than 1,000 successfully delivered projects. Our clients span industries, size, and geography. Some are Fortune 500 companies while others are smaller, rapidly growing ventures. Since our founding in 1980, we have established long-term relationships with our clients based on our ability to help them in the full project lifecycle, from vision through implementation. In contrast, most strategy firms focus on formulating recommendations, but see implementation as a messy detail item that is beneath them. On the other hand, technology companies often see technology as the main catalyst of change, and consider strategic planning to be a one-time, up-front exercise before the real action starts. At Princeton Consultants, you will experience the power of combining the two halves into a stronger whole. You will help create projects that are driven from a strategic, best-practices viewpoint, and powered with the latest and greatest in IT. "On some projects we act as a translator or intermediary between business and technical people. We make sure everybody understands and they know what system they're going to be getting at the end of the day."